Cam 2, Radial. TN - very hard white sandy matrix; B/G abraded surfaces. 1. 2 BRW. 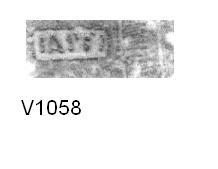 Noted as identical to V506 and thought at the time of recording to be from the same platter, although this is scarcely possible given the contexts.